Buyer Beware! 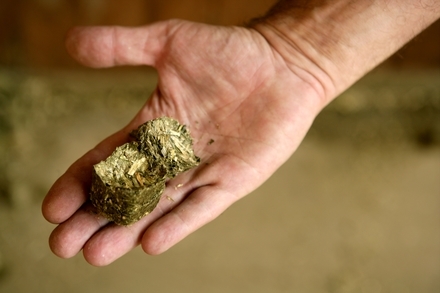 What's in Those Feed Products You Give Your Horse? Nutrient ingredients for commercial horse feed. Can you identify them? Have you noticed any "Buyer Beware" labeling on horse feeds, supplements, medications, or herbal products as you have scanned the feed store shelves and internet sites that hawk products for horses lately. Probably not, but what you don't know can harm your horse and cost you time, effort, and money that may not only be wasted, but actually be harmful to your horse's health. Any time that a product claims to be completely unique or have a new special ingredient, beware! What you don't know about what you are giving your horse can harm your horse and cost you time, effort, and money that may not only be wasted, but may actually be harmful to your horse's health. The federal Food and Drug administration includes the Center for Veterinary Medicine which is responsible for the regulation of animal drugs, medicated feeds, animal food additives and devices for use in animals. The ingredients and additives in horse feeds and supplements are subject to the same laws as those that protect humans and other domesticated animals. Horse owners should think twice before buying unapproved products based on anecdotal information or unscientific case studies attributed to them. Numerous horse feed supplements, vitamins, minerals, and health enhancers are being marketed without proper research as to safety and effectiveness. Horse owners are always on the lookout for new feed supplements and other products that will improve the horse's health or give the horse a competitive edge in the show ring or on the race track. Unfortunately, the subjective nature of most evaluations of equine performance lends itself to the promotion and sale of products that, while they may not harm the horse in the short term, serve only to enrich the sales promoters and may cause serious problems for the horse in the longer term. If the feed contains drugs, the drugs must be approved by the FDA for use in animal feed. 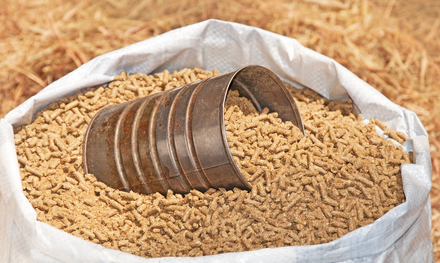 State and federal regulatory agencies work together to provide the rules, guidance and oversight to assist industry in producing and distributing safe animal feed and feed ingredients. Problems often arise for the horse owner when it comes to understanding the meaning of terms related to feed, supplements and medications. For example, what are the differences between a food, a drug and an additive under FDA guidelines, especially as they relate to feed tags and supplement information? A food is defined as an article that provides taste, aroma, or nutritive value. Substances such as hay and grain that we call horse feed are classified as "food" by the FDA. A food additive, as defined by the FDA, is a substance that directly or indirectly becomes a component or otherwise affects the characteristics of a food. A substance is not a food additive if it is generally recognized as safe for its intended purpose by scientists qualified by training and experience to make such a determination. Some examples of food additives used in horse feed are anti-caking agents, pelleting aids and preservatives. While we usually think of "drugs" in a rather straight-forward way, the FDA describes a drug as any substance, food or non-food that is used to treat, cure, mitigate or prevent a disease. 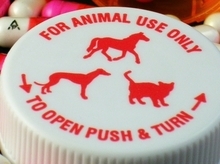 A drug is also any non-food substance that is intended to affect the structure or function of the animal. The FDA describes a drug as any substance, food or non-food that is used to treat, cure, mitigate or prevent a disease. What distinguishes a food from a drug or a food additive is the intended use. For example, when vitamin E is used as a source of an essential dietary nutrient, it is considered a food. When it is used to treat a disease such as azoturia, it is a drug. A new animal drug must be subjected to an approval process before it can be marketed, while a food is not required to go through the process unless it is considered to be a food additive. In addition to food, food additives and drugs for horses, another type of product is heavily promoted in the market place. Known as "nutraceuticals," these products often claim to prevent or treat disease, but are marketed under the guise of food supplements. These products include those that contain levels of essential nutrients beyond what is recognized for normal nutrition or those that contain certain nutrients that are not recognized as essential for the intended species. Horse owners should think twice before buying unapproved products based on anecdotal information or unscientific case studies attributed to them. Most of these products have not gone through any acceptable research, nor has any agency deemed the products safe and useful. Among products that claim to enhance the horse's health, growth, endurance and speed are products such as Gamma Oryzanol which is an extract of rice bran that has not been proven safe or effective for use as a growth source in horses. Another product that is promoted to improve endurance and speed reaction time is Octaconsanol. Found naturally in small amounts in plant waxes and some vegetable oils such as wheat germ no research is available showing it to be safe or effective for any use with horses. Some products contain levels of essential nutrients beyond what is recognized for normal nutrition or those that contain certain nutrients that are not recognized as essential for horses. Other products are advertised as feed supplements for treatment of musculo-skeletal inflammation and stress and for disease prevention. These enzymes are proteins and no research is available to show that any intact enzyme would be absorbed and available to the cells in the horse's body. Essentially these enzyme based products such as Dismutase are simply a very expensive protein source. The number of products on the market being promoted for use in feeds to increase synovial fluid viscosity in the joints and improve and strengthen the connective tissue and joints has grown drastically over the past few years. These various forms of mucopolysaccharides such as glycosaminoglycans and chrondroiton sulfates are promoted to treat non-infectious degenerative joint problems and to increase synovial fluid in the joints. They are considered to be unapproved new animal drugs because they have not been proven to be safe and effective. Also, when given orally, there are questions about the extent of absorption and how they reach the joint in sufficient amounts to have any effect. In the vitamin category, vitamin B-15 also known as pangamic acid, which is a derivative of apricot pits, is claimed to decrease lactate production and plasma lactate levels after exercise and to improve speed. Neither pangamic acid or any of the products using it has been proven safe or effective for any use in horse diets. The FDA issued letters to a trio of Florida-based companies accusing them of marketing a number of products as horse supplements when they are in fact âintended for use in the mitigation, treatment, or prevention of disease in animals, which makes them drugsâ per federal regulation. Tryptophan and magnesium are two nutrients that are being marketed for use in large quantities under the claim that they are good for sedative and calming purposes. Giving tryptophan in large doses for sedative purposes can cause severe amino acid imbalances and deficiencies in other amino acids and can be toxic. Large doses of magnesium can interfere with the utilization of other minerals and result in mineral imbalances. Biotin, a B vitamin, is often promoted for use in horses, although the NRC's Nutrient Requirements of Horses does not list biotin as a requirement. No controlled studies have been published so far. Although biotin is often recommended for use in improving the hoof quality and growth in horses, no data is available to support its use and it is considered to be an unapproved food additive. Herbal plant extracts are also often marketed as feed supplements. Although many of them may not be unsafe to feed to horses, there is no scientific data in horses on the safety and usefulness of herbal products. Most information is merely anecdotal and herbs often contain chemicals that can be harmful such as certain alkaloids and other toxic substances. Numerous other feed supplements, vitamins, minerals, and health enhancers are also being marketed without proper research as to safety and effectiveness. It is impossible to note all of them in this article. When you come across such an item, discuss it with your veterinarian or do some research on your own to determine whether the product does what it claims to do. Always read labels carefully and look for disclaimers on the label and promotional material that read: "This product is not a drug," but then go on to claim the product prevents, mitigates, treats or cures a disease. Don't believe exaggerated claims that are too good to be true or that a product may solve a variety of problems. Realize that all labels for feed supplements should have a statement that describes the intended use, a list of the ingredients in descending order of predominance, a guaranteed analysis and a dosage. Don't fall for scare tactics such as statements that claim that a horse has been suffering from a deficiency for years and the owners were unaware of the deficiency or how to treat it. Any time that a product claims to be completely unique or have a new special ingredient, beware! Realize that all labels for feed supplements should have a statement that describes the intended use, a list of the ingredients in descending order of predominance, a guaranteed analysis and a dosage. Compare these ingredients to the daily requirement for nutrients for your horse to see if it is properly formulated and does, in fact, meet the horse's needs. Hay replacer products combine ground forage and grains to provide a complete source of nutrition. 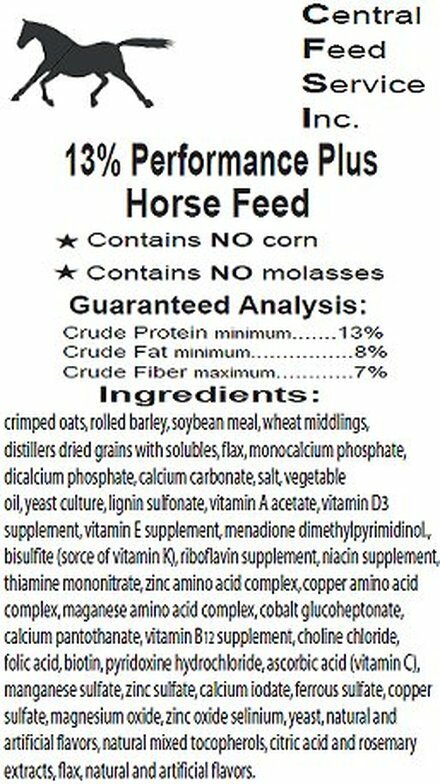 Reading the nutrition and feed tags of some products for horses can be quite confusing. A number of companies offer hay stretchers which are pellets or cubes made up of a combination of hay and grain by-products. Fed in conjunction with hay, or in place of it, these hay stretchers provide added fiber and nutrients to the horse's diet, but don't contain much hay. Hay replacers are usually made up of actual hay in combination with grains, cereal grain by-products and sometimes molasses and can replace 100% of the horse's hay ration. These hay pellets are complete feeds with grain and hay all in one pellet and have been formulated to meet the horse's needs for forage, fiber, and nutrients. An informed horse owner is aware of the horse's nutritional requirements given its age, workload, condition, climate, and physiological makeup. Base your feeding program on high quality grass or hay forage and provide necessary nutrients by using a fortified grain product formulated for horses such as yours. Adjust your feeding program as dictated by changes in body weight, performance demands or reproductive status. Educate yourself about your horse's nutritional requirements and ask your veterinarian's advice before adding supplements or other products to your horse's diet. As an educated horse owner, you will save yourself time and effort, as well as money that can be spent to better purposes.